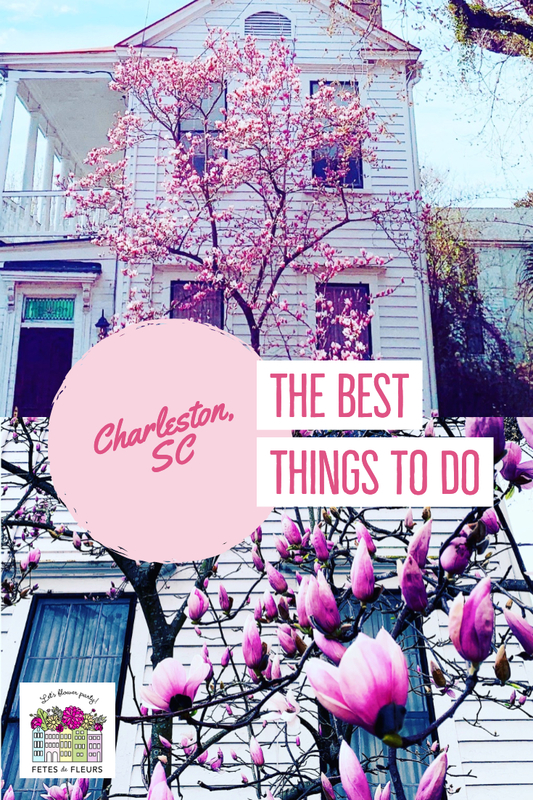 Do you want to stay downtown in Charleston? Or do you want to stay at one of our beaches in Charleston? Those are the main 2 decisions you will have to make when you decide to come to Charleston for a weekend here. There are lots of great things about staying downtown and staying at the beaches so figure out if your girls group wants to be able to walk out the airbnb or hotel and just bop around downtown to the restaurants, bars and shops. OR do you want to be right at the beach at an airbnb or hotel so you can spend most of your time at the pool or beach? If you do decide this just know you will have to uber or lyft back and forth between the beach and downtown. That is okay though! Seriously both are fabulous options. You can check out my guide to Charleston beaches here to learn more about what is up with our beaches here. 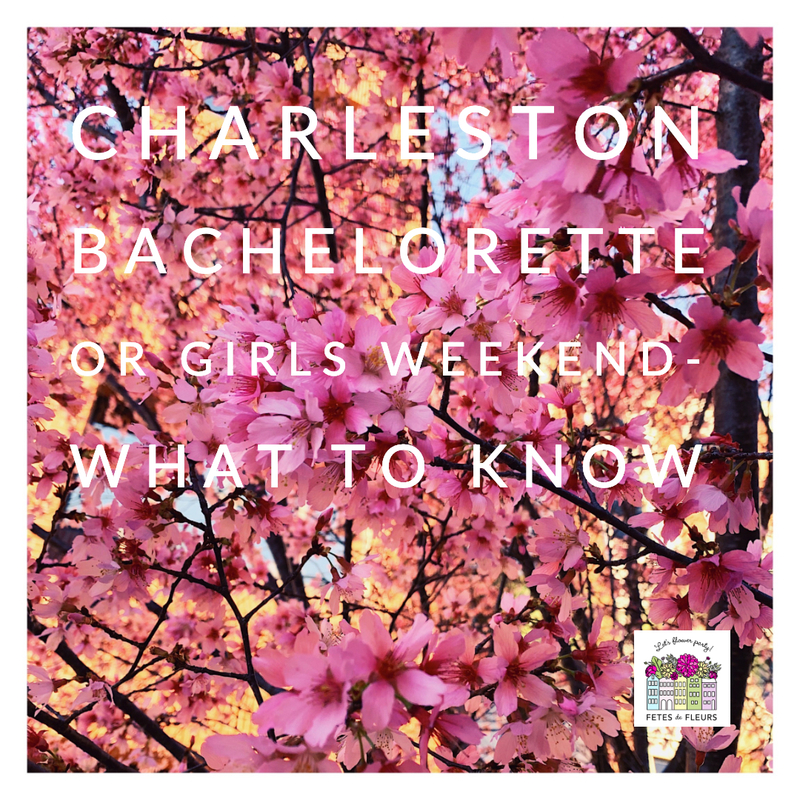 Okay now that you have decided where you want to stay you have to figure out the top things to do for your ladies weekend here or bachelorette weekend here in Charleston. 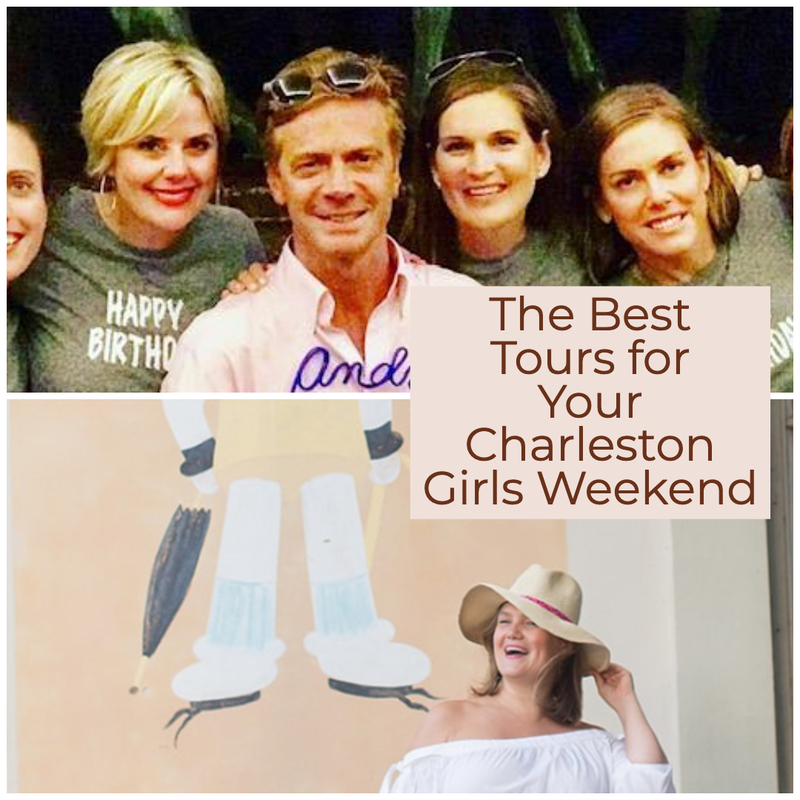 Here are my top activities and things to do for a Charleston Girls Weekend. If you are coming to Charleston you really should head out on a boat or a sail boat for a tour on the water. It is seriously so beautiful and you might even see some dolphins if you do this. Here are my favorite vendors for a boat trip or sail boat trip here in Charleston. My friend owns this company called Mental Heeling. He can take your group out on a sail boat here in Charleston for a magical sail. You can book a private Charleston sailboat charter here on his site. I promise you will have a magical time. This is good for a group of 6 or less girls. Salt Water Cycle: This is a pedal boat where you sit on a bike and pedal the boat around. Okay, you don't really do all the work but it is so fun to sit there and have a drink or two in the sun while pedaling around Charleston harbors. You can book a seat on one of their public tours or you can build a private boat tour with them. The boat holds up to 16 people so if you have a larger group this is always a perfect, fun activity for the bachelorette party group to do. Palmetto Breeze: If you want to spend some time in Shem Creek here in Charleston you will want to schedule a seat on the Palmetto Breeze. I always have a great time on this boat and it leaves right outside of Tavern and Table in Shem Creek. So kill two birds with one stone and spend some time at a bar or restaurant in Shem Creek having an early dinner then head out on the boat. 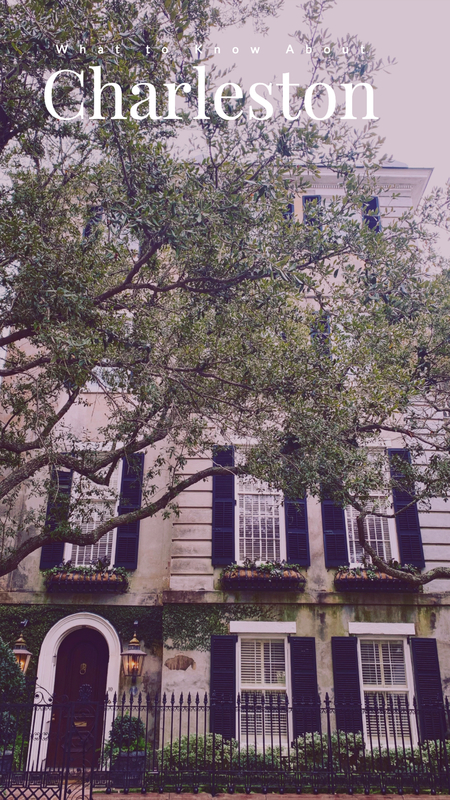 You need to do a walking tour of downtown Charleston and the historic battery area of Charleston where all of the pretty houses are. Oh, I mean, MANSIONS are. 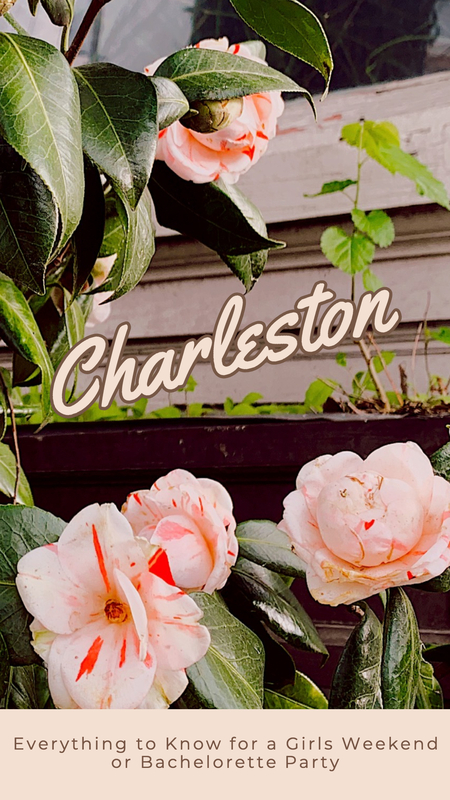 You will not want to miss doing a walking tour of Charleston because you will get to experience Charleston on foot and see all of the beautiful houses and flowers as you walk around downtown. You will not regret doing this. If you don't end up doing a walking tour I would recommend that you do rent bikes or take the Holy City Bikes that we have around town around the battery area. 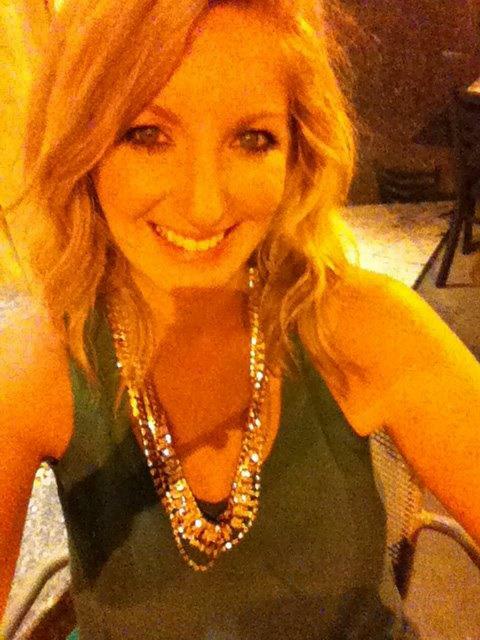 Just wander around on foot or on a bike with your bride tribe or girls weekend group and will be so happy that you did! My friend owns this company and she is so good at what she does. She knows the history of our town and she is also super fun. She will take you on a tour of Charleston's historic district telling you about the characters and people our city's history holds. She is super funny too and knowledgeable so we promise you will have a lovely time doing this. Group tours are available on Saturday and Sunday for $25 PER PERSON. This is such a great deal. You can schedule a tour here. You might remember this amazing man from Southern Charm Charleston. He is such an amazing man and so funny. You will be so glad you took this tour with Cooper because he: 1. knows all the best things about Charleston 2. He is hilarious and awesome. You will have the best time spending your afternoon with him. You can book his tour on his facebook page here. We have some pretty good shopping on King Street and directly off of King Street for you ladies. You won't find a mall here and thank god for that. But, what you will find are some super cute stores that you can buy some cute clothes at, jewelry and other things. I thought I would tell you what my favorite boutiques are in Charleston in case you do want to get some shopping in while here on your weekend. Maris DeHart: this is owned by a friend of mine and I would highly recommend going here. This is located just off the beaten path of King Street a couple of streets over off of the touristy area of East Bay Street. Make sure you go here because you will find the best clothes that are not from big box stores. You will find the cutest jewelry, earrings and sunglasses. They also have the best selection of bathing suits too and summer clothes. If you want to shop at a local boutique that all us local ladies love you should definitely go here. I promise you will leave having had a great time chatting with the employees or the owner herself (or her mom) and you might even have some vino while doing it too. Hampden Clothing: this is owned by a woman as well. I think you are getting the point. Actually all of these are owned by women. 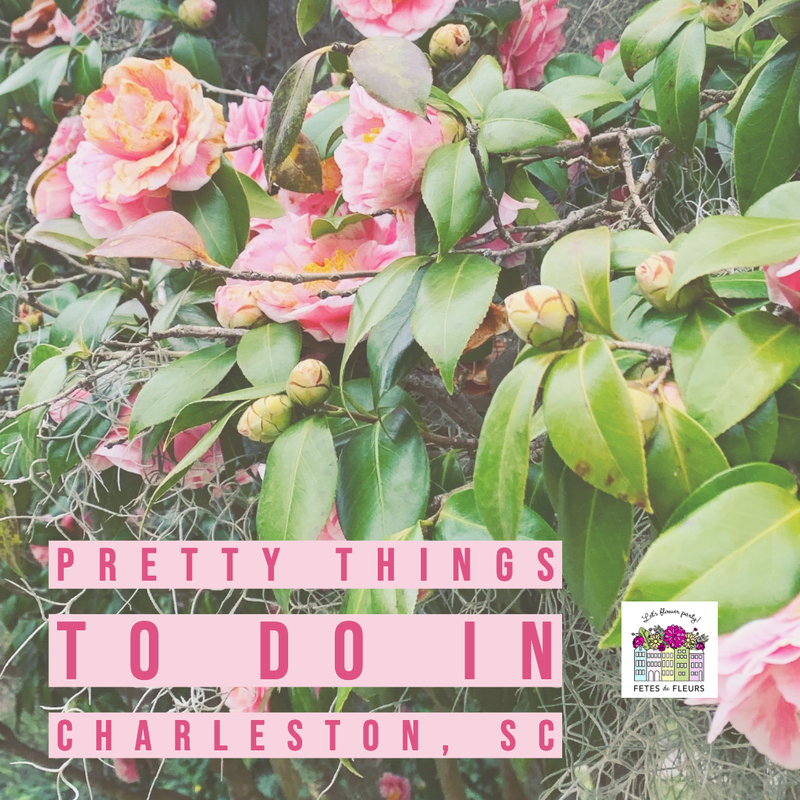 We have an amazing community of women owned businesses here in Charleston so you will know you are shopping at good places if you go to any of these. This place is high end and has all the high end stuff you will want. This is where all the Charleston influencers and bloggers shop. Very cool store and has all the high end things you might want to pick up if you want to splurge while here in town. They also just recently opened a lesser price point version at Small by Hampden which is right on King Street too. Cannonborough Collective: this is off King Street too but you can easily walk here from King Street area. Just look it up on google maps. This is owned by 2 local ladies here and they have all kinds of goodies from local makers here in their store. They also have a balloon bar so if you need balloons for your bachelorette party here in Charleston you should pick them up here. If you are looking for fun bachelorette party gifts or favors for the group from local Charleston makers I would head here for sure. We love it there and love to support local Charleston makers. The Community: this place is fairly new and is over by a great restaurant called Mercantile and Mash. This is also a place where you can find a lot of local women makers products for sell. It is a cute spot and also pretty insta worthy if you want to see Instagram worthy spots here in Charleston. Becket Boutique: this place is on King Street and is so so so cute. If you like pastel colors you will love it here. They have an awesome space and is so pretty so if you like pretty stores and want to see it you should go. You can find the cutest, pastel colored clothes and dresses here. Highly recommend this spot for cute clothes and also cute jewelry too. We also do have the normal stores that you might like or big box ones like ANTHRO (ps- my bestie here is the manager there so swing by and say hello to Hayley) and also Free People (a new one to boot). You will find that most stores you will want to go into are on King Street just right after Calhoun Street. But, a couple of those above are not on the main drag and that is not a bad thing. So take the time to go to some of the boutiques here in Charleston that are not on the main tourist area. You will be glad that you did. 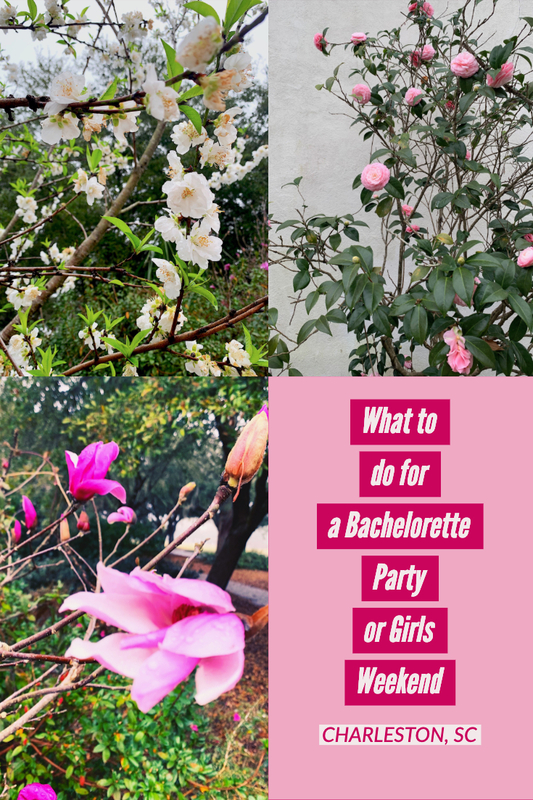 Nail Salons or Spas that you might want to check out for a Spa bachelorette party activity. Mylk Bar - this place is right over the bridge into MT P which is just a quick hop over from downtown so don't fret. You have to go here! This is owned by a sweet friend of mine, Katie. She started this as our first non toxic nail salon here in CHS and is expanding to other cities like Nashville in the year to come. All the southern charm ladies go here too and all the influencers and bloggers here - so if that is your thing check it out! I promise you will have the best experience. We love it here. The Water Room - this place was started by a beauty blogger who lives here in Charleston. Another women owned business here in Charleston (very normal here- we have amazing women entrepreneurs and alot of places on this list are women owned businesses). This was started by the lady who runs Bare Beauty Blog and you can check out her insta here if you love all things beauty like we do. Dewberry Spa - Swanky spa downtown at the Dewberry Hotel. We recommend spending an afternoon here and then getting a reservation on their rooftop bar called Citrus Club for a sunset cocktail or 2. This sounds like the best afternoon with my girl tribe or a bride tribe. Woodhouse Day Spa - Also owned by a GIRLBOSS here in Charleston. You should definitely look into their different packages if you want to spend an afternoon or morning getting pampered. This is also across the bridge in MT P but don't worry - like I said quick uber over there and then you will be zenned out and spa-tastic in no time, ladies. 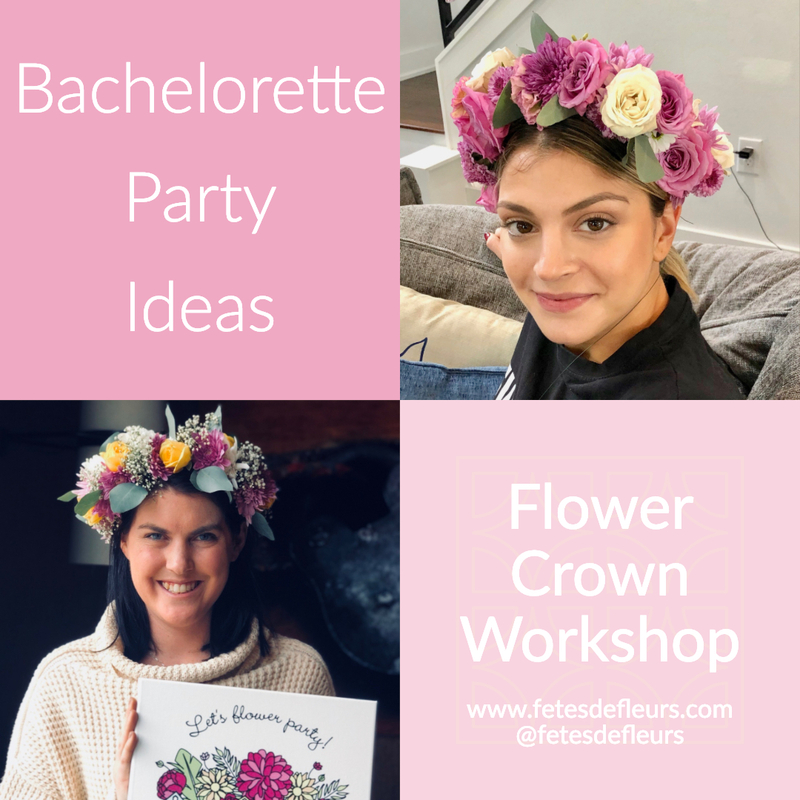 A Flower Crown workshop with US! HA! We had to put ourselves in here. But, honestly even if this was someone else's company this is such a great activity to do while in Charleston. We come to your airbnb or hotel or location that you pick to setup our signature flower bar. We then teach your group how to make flower crowns over a fun filled lesson. You will learn a new skill while doing the most girly thing ever over flowers. What is better than doing an activity that is as girly as flower crown making? 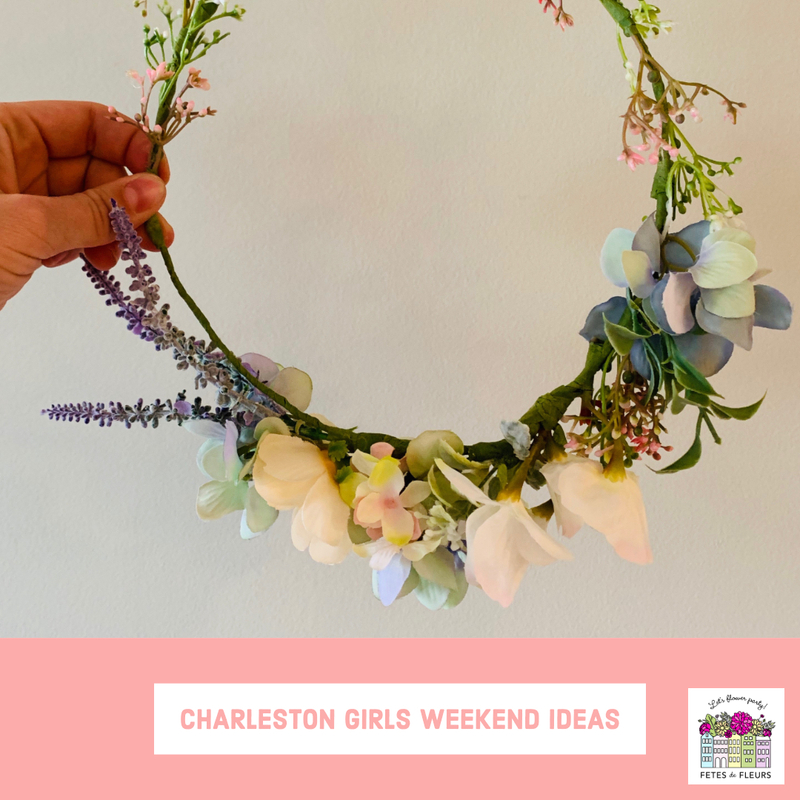 If you don't want to make the flower crowns or maybe you have booked too many things into the weekend here we can always make the flower crowns for you and drop them off to your house or hotel. We also do floral arranging workshops for groups- so if that is more your thing just let us know in your request. You can email us at ali@fetesdefleurs.com to book any kind of floral activity with us. Leon's Oyster shop: Sit outside and enjoy the sunshine over a beautiful spread. I would recommend getting an ice cream cone with rainbow sprinkles after you are done too. Goat Sheep Cow: Legit my favorite place in the world. If you want to have a cheese and meat plate over some rose in the sunshine you should go here. Sit on their back patio and have a leisurely afternoon enjoying wine with friends. Get the cheese and meat plate and go for the rose happy hour. You will leave here a group of happy, go lucky ladies. Barsa: Go here and sit on the patio and enjoy the sangria in the sunshine. You will be so happy that you did. They have amazing tapas plates too. Revelry Brewing: Head upstairs when you get there and grab a beer or a rose. This is a great spot to watch the sunsets too. You are super high up and if you love beer and being outside this is the spot for you. You can also order sushi from a food truck here. Edmunds Oast: A great spot with lots of tables where you can drink beer, wine and have great food. They also have a good wine/bar shop right there for you to bring home some goodies for pre-game too at your house or hotel room. Home Team BBQ: Head to the downtown location if you want to sit outside and maybe catch a live band on their stage there. If you want good bbq while here in town you can't go wrong here. I love their nachos and their game changer (slushie drink). Make sure you order the slushie drinks here. Basic Kitchen: We love this place for either inside or outside. You can come here any time of day for a good meal and good, beautiful time. They have an amazing beet margarita and all the food is so healthy and good. If you want to go some place that is beautiful, girly and veggie food head here. Spend some time outside in the sun on the back patio. We hope this was helpful and that you are excited for a weekend here in Charleston, SC with us! If you have any questions about anything or need help planning any part of your weekend reach out to us at ali@fetesdefleurs.com. 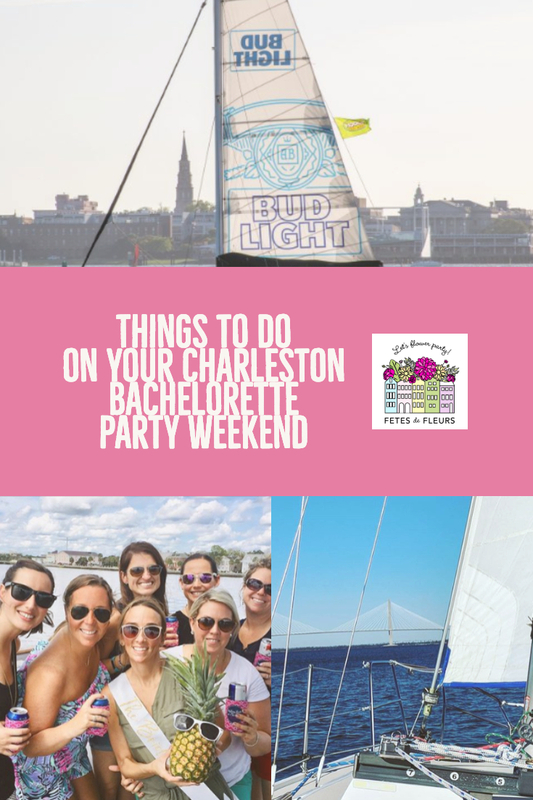 We have plenty of posts on all things Charleston including our Charleston bachelorette party guide from 2018 and from 2019 here.